How good can the Lions' offense be? With the addition of two second-round draft picks — WR Titus Young and RB Mikel Leshoure — how good can the Lions’ offense be? “If we are able to stay healthy I don’t think there’s a question we’ll be successful on the field with all the weapons we have,’’ wide receiver Calvin Johnson said. Wide receiver Nate Burleson agreed with Johnson. “There was a lot of questions about the draft and what we should do. The areas we should have interest in. I said from the beginning we should draft the best available athlete on the board,’’ Burleson said. “I like exactly what they did, I don’t care if it’s a position I’m playing or a position that someone else is playing, if you get the best athlete you’re going to be in position to make plays. With the firepower we put on offense this year it’s going to be explosive,’’ Burleson added. Even without Matthew Stafford for most of last season, the Lions managed to win six games. If the 23-year-old quarterback can stay healthy they are immediately better. Add the two rookies to the mix and there should be no questions. On paper there are no holes on the Lions’ offense. Now they just have to make it work. 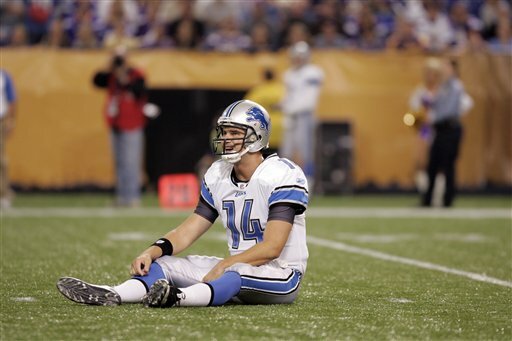 Like most NFL players, the Lions are a bit frustrated. They would rather be preparing for the season with Lions’ coaches calling the shots. But that can’t happen until the NFL lockout is lifted. The next hearing is set for Friday but that doesn’t mean a decision will be made then. Most of the Lions said they don’t follow the situation that closely. Cliff Avril said he’ll know there’s a solution when his agent calls him and tells him to get to work. Matthew Stafford has similar feelings. The Lions have scheduled a follow-up to their informal workouts the week of May 16. Starting Monday, June 6, they will be back at Country Day, working out for four days that week. Avril is one of the Lions who could be called some type of Twitter-holic. He has plenty to say and tweets quite often. But he’s not the ony one. Twitter is all the rage with the Lions. Matthew Stafford started his account a few months ago. He kept everyone updated on the progress of his shoulder rehab. Now he’s cheering on his hometown Dallas Mavs. Thursday he tweeted a pic that words would do no justice. Ndamukong Suh is a regular in the Twitter-verse. On Tuesday he tweeted that he was in London, England. Rookie Titus Young has received much love from the Detroit fans through his Twitter account. Coach Jim Schwartz started a contest on Twitter on Thursday to name the newly revamped D-line. Tweet him a suggestion and be in the running to win an autographed football. If you’re a Lions’ fan and you’re not on Twitter, what are you waiting for? It’s free and it’s another avenue to stay in touch with the Lions. 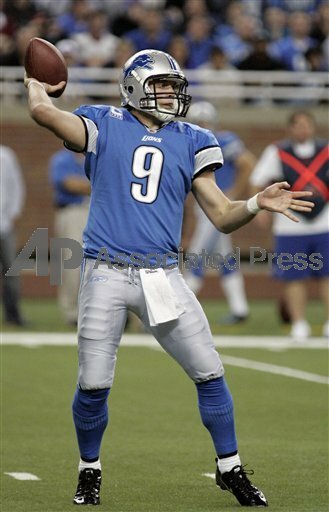 To get you started (twitter.com) here are some of the Lions’ Twitter addresses: @Staff_9, @J4hvidbest, @cliffavril, @LoJackson94, @Bigplaycj, @JasonFox70, @MLeshoure5, @Nick_Fairley251, @TitusYoung, @Lt_Campbell53, @LouisD_26, @jfelton45, @zakarianfollett, @B_Johnson80, @ndamukong_suh, @DWheelz12 and @jschwartzlions. Apparently Lions coach Jim Schwartz has a little time on his hands. Wonder how that could be? So he’s started a contest on Twitter to name the revamped Lions’ defensive line. The winner will receive an autographed football. Some of the entries so far include: Sack Attack, Blue Steel, Blue Crush, Suenami, The Pride and the Honolulu Blitz. To enter send Schwartz a tweet @jschwartzlions. If you're not on Twitter, it's free. Sign up at Twitter.com. Brandon Fisher, son of former Tennessee Titans coach Jeff Fisher, has been added to the Detroit Lions coaching staff. The younger Fisher will work as an assistant to the defensive coaching staff. The announcement was made today (Thursday). Brandon Fisher stepped in to help the Titans last season after offensive coordinator Mike Heimerdinger was diagnosed with cancer during the season and moved from the sidelines to the coaching box. A blog by Paul Kuharsky at the NFL Nation said that Jeff Fisher wanted to add his son to his Titans’ staff for the 2011 season amd reportedly that was a breaking point for Titans’ owner Bud Adams who doesn’t believe in nepotism. Jeff Fisher was fired by the Titans in January. Brandon Fisher was a standout linebacker at the University of Montana where he played in 54 games (30 starts) and finished with 169 tackles. Lions coach Jim Schwartz came to Detroit after spending nine seasons on the Titans coaching staff under Jeff Fisher. During a normal offseason when the NFL has not locked out its players, the teams start offseason training in mid-March and then OTAs (organized team activities) in May. A few minicamps are also sprinkled in the mix. Obviously it’s all different. Most of the Lions don’t live in Detroit in the offseason, so they’re staying close to home and working out on their own. At least two of them are making the best of it. Wide receivers Nate Burleson and Calvin Johnson, who both attended the informal workouts at Country Day last week, said they are enjoying spending time with their families. Johnson, who lives in Atlanta, said this may never happen again, so he’s enjoying it while he can. Same for Burleson who lives in Seattle when he’s not in Detroit. While they are enjoying their family time, they continue to work out too. Both were clearly in good shape during last week’s workouts. NFL players have prepared for this lockout. For years they had suspicion it was coming. The smart players planned financially and even if the season is canceled (which I don’t see happening) they will be OK. There’s a few guys who are the exception, but they only have themselves to blame. But what about the people whose livelihoods involve the Lions? The people who don’t play football, but who earn an honest living. They are feeling the brunt of this lockout. The Lions’ staff has been forced to take two weeks of furlough (unpaid leave). Certainly they planned ahead too, but it’s much different when you’re earning regular wages not millions of dollars per year. It’s unbelievable that both sides are so pig-headed that they will let this happen. They’re letting the fans down, but more importantly they’re hurting the budgets of hard-working people who deserve better. The players recognize that others are suffering. “To be honest people who working at the stadiums and the facilities, there’s a lot of people who depend on this money. I’m OK, I can honestly say there’s a lot of people I think about who are affected more and that’s what really upsets me,’’ wide receiver Nate Burleson said. Noticeably absent from last week’s informal workouts at Country Day was defensive tackle Ndamukong Suh. While Kyle Vanden Bosch mostly put the four-day program together, he got little response from defensemen. No linebackers were present and just a few defensive backs. Now in their defense, there wasn’t a lot of lead time and it was voluntary. If you follow Suh on Twitter you know he’s a busy guy with all his marketing and promotional work. Seems he’s never in one place too long. Today he tweeted from London, England. We’ll give him a pass for not attending the workouts last week. 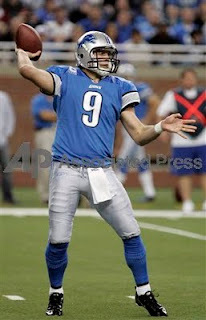 But when the Lions crank it up again the week of June 6, it will look bad if he’s not there. He’s supposed to be a team leader. This is one reason he’s paid the really big bucks. The only rookie present was WR Titus Young, but Vanden Bosch took the blame for that. Plus there was an NFL event for selected rookies in Los Angeles late last week. It will be interesting to see who shows up the week of June 6. Best was one of the 30 or so Lions who participated at the informal workouts last week. Rest during the offseason has been the best medicine for the turf toe that slowed him down most of last season. “It had its days but basically every time I tried to cut or plant or explode I was feeling it in my feet, so it was hindering my abilities to be the player I am,’’ Best said explaining his situation last season, his rookie year. He is excited about playing with Mikel Leshoure, the Lions’ second-round draft pick. “They felt like he was the right guy so I’m happy about it. As soon as he got drafted I got his number and I was telling him we’re going to need a nickname,’’ Best said. 1. Obviously just the fact they bothered to pull it together should show the fans how much they care. Most of these guys have offseason homes elsewhere, so it wasn’t like they rolled out of bed and headed to Country Day. About 30-35 guys showed up which is better than the numbers for most NFL teams who have tried these informal workouts. They are obviously in shape which is another key factor. Kyle Vanden Bosch was the instigator here and should be credited. It was so successful it will be repeated the week of June 6 and more players are expected. 2. Quarterback Matthew Stafford said a number of times that his shoulder is 100 percent and then went out and proved it by throwing blistering bombs. Rookie Titus Young joked that his hands were stinging so much he wanted to stick them in a bucket of ice water. 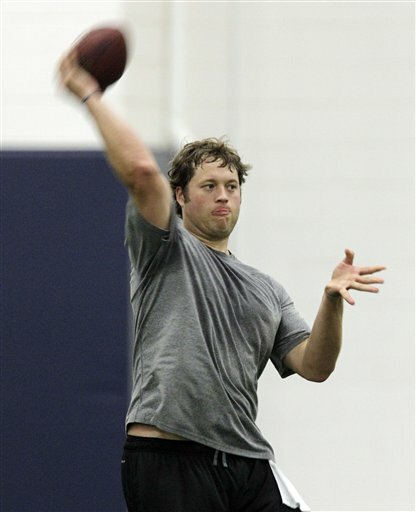 Also, Stafford has bulked up. He’s noticeably wider across the shoulders. Said much of his rehab was work to make his back stronger, which in turn should keep his shoulders healthy. 3. Titus Young is raw, but his new teammates said he had impressive hands for a guy of his size. He looks really skinny. He’s listed at 5-foot-11 and 174 pounds. Aside from his hands, Nate Burleson said he had a great work ethic and was willing to do whatever the guys wanted him to do. 4. Safety Louis Delmas is not 100 percent after his groin surgery in January, but he’s close. He puts it at 85 percent. He participated in most of the drills and looked sharp. In fact, better than he did all last season. 5. The offensive line is whole, back and hungry. Stephen Peterman who was slowed last year with a torn muscle in the bottom of his right foot is healthy. Gosder Cherilus, who had microfracture knee surgery in December, is close. This line has been together and appears they will return intact. Wouldn’t say there’s a chip on their shoulders, but think they might have something to prove. 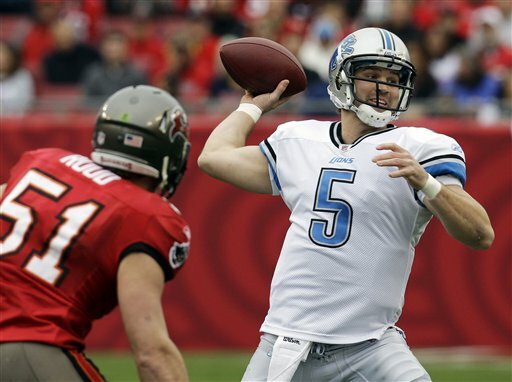 BEVERLY HILLS — Of all the players at the Lions’ informal workouts this week, quarterback Drew Stanton is perhaps in one of the strangest positions among his Lions’ teammates due to the NFL labor issues. Under the old rules the 27-year-old Stanton became a restricted free agent after last season and the Lions offered him a tender, meaning they want him to return. But no one knows just yet what the new rules will be. Could turn out that Stanton, who played at Farmington Hills Harrison and Michigan State, is an unrestricted free agent under the new contract. Lions general manager Martin Mayhew went on record in January saying they wanted Stanton to return. With injuries to Matthew Stafford and Shaun Hill last season, Stanton stepped in starting three games and playing in six. He was impressive, completing 69 of 119 passes for 780 yards including four touchdowns with just three interceptions. He also rushed for 113 yards and a touchdown. What will it mean if he’s unrestricted? The Lions wrapped up four days of workouts on Thursday. They’ll reconvene for another four-day session on June 6. BEVERLY HILLS — An old familiar face appeared at the Lions informal workout on Wednesday at Birmingham Detroit Country Day. Cornerback Dre’ Bly, who played with the Lions from 2003 to 2006, worked out with the defensive backs after an invitation by S Erik Coleman. Bly was back in training camp with the Lions last summer, but was cut before the season started and never hooked on with another team. Still at age 33, he’ll be 34 on Sunday, he feels he has football left. Bly still lives in metro Detroit. He works out at Lifetime Fitness (where he continually is asked about football) and plays pickup basketball to help stay in shape. Even though he was cut by the Lions, he is not bitter. In fact, he watched the Lions play last season carefully. Is there a Lions’ roster spot for Bly next season? No one knows, but if they’re looking for a corner who can also play special teams he is probably not the guy. Safety Louis Delmas, who didn’t work out with the Lions on Monday, was in attendance on Tuesday at the informal workout with 34 of his teammates. You couldn’t miss him. His mouth still goes 100 miles per minute. “It’s like white noise, I don’t even hear it any more, I didn’t even know he was here,’’ Kyle Vanden Bosch said. BEVERLY HILLS — Lions backup quarterback Shaun Hill jogged along the sidelines during the Lions informal workout today (Tuesday) at Birmingham Detroit Country Day. Even that was an accomplishment considering that Hill underwent back surgery just six days ago. “I jogged a little (Monday) didn’t feel great, today it felt better,’’ Hill said. “It was just kind of time to get it fixed up. I wish I had done it a few months ago but I’ll be full-go by training camp,’’ Hill said. Hill was one of four quarterbacks and 35 Lions players participating in Tuesday’s informal workout. It was the second of four this week. With the NFL in lockout mode, about 30 of the Detroit Lions worked out on their own on Monday at a local high school. It was an offensive-heavy group with players like Matthew Stafford, Jahvid Best, rookie Titus Young and the whole offensive line in attendance — among others. Defensive end Kyle Vanden Bosch, a team captain, helped organize the workout, the first of four this week. Wide receivers Calvin Johnson and Nate Burleson are expected in for Tuesday’s workout session. The consensus among those in attendance was that it was good to see everybody and easier to work out in a group setting. More on the Lions workout to come today, including a look at Matthew Stafford (whose shoulder looked fine) and rookie WR Titus Young who is looking to restore the roar. While passing time during the NFL lockout, Lions’ defensive tackle Ndamukong Suh has set another record. This one off the field. In fact, Suh has set a Guinness World Record. Here’s the official record text: "The most attendees at a 'Tweetup' is 1,935 and was achieved by Ndamukong Suh (USA) at the Hawks Championship Center, Lincoln, Nebraska, USA, on 16 April 2011." Impressed? Or are you just wondering what the heck is a tweetup? It’s a group brought together by sending messages on Twitter. Suh is quite active on Twitter @Ndamukong_Suh. So the NFL labor dispute is still in the courts, but that doesn’t mean there isn’t work to do for the Lions, even if it’s not at the practice facility in Allen Park. Quarterback Matthew Stafford, who is coming off shoulder surgery in late January, tweeted today (Thursday) that he was getting ready to throw with Calvin Johnson and Lions’ rookie WR Titus Young. It’s good to see that Young, the Lions’ second-pick out of Boise State, has hooked up with Stafford. It’s never too soon to get used to connecting with a new quarterback. Also joining them were rookie A.J. Green, the fourth overall pick by Cincinnati; Chad Hall, the Eagles’ wide receiver and Kris Durham, who played at Georgia (Stafford’s alma mater) and was drafted by the Seahawks. As for the labor situation, the lockout is still in place thanks to an emergency stay by the 8th Circuit Court on April 29. A hearing is set for June 3 and it appears now that the stay will remain in place until then. Although nothing seems certain. Also court-ordered mediation will resume on Monday, May 16. Since the Red Wings ended their 42-year Stanley Cup drought in 1997, at some point the culture changed. At some point, just slipping the Red Wings sweater over the shoulders made a good NHL player better. It should be what all teams aspire to, not just in the NHL either. This is what the Lions should be watching and I think they are. Lions coach Jim Schwartz tweeted today that he loves playoff hockey. If the Lions stick to their plan of building for the future now, maybe possibly in years to come the Lions jersey will become special too. Maybe. It’s not easy. Not many teams have accomplished this. Watching the Red Wings win Game 6 on Tuesday night, you could almost sense it. This is one of the winningest franchises in sports since 1997. The sweater makes them better, but so does the attitude when they’re wearing it. There’s something about the Red Wings. They can never be counted out, because they never count themselves out. They don’t quit. Ever. Guys like Nick Lidstrom and Kris Draper have seen it all. Heck so has Pavel Datsyuk who won the Stanley Cup as a rookie in 2002. Some of the younger buys like Darren Helm and Justin Abdelkader have to be soaking this up. This doesn’t mean the Wings win every playoff game — although I wouldn’t bet against them in Thursday’s Game 7 at San Jose — but it means they are in every game and every playoff series. Injuries happen, even the best teams stumble. But with the Wings, you expect them to lace up the skates the next season and compete with the best. Then you watch them do it. General manager Ken Holland can’t get enough credit. Remember when the salary cap era began, and those who didn’t know what they were talking about said the Red Wings could no longer buy championships and would certainly take a big fall. Holland just works his magic within whatever guidelines that he is handed. They also draft well and exercise patience. The Wings drafted goaltender Jimmy Howard in 2003 (64th overall) and no one could really be sure he was the future until about now. It’s legend how all other NHL teams bypassed Datsyuk and Henrik Zetterberg who were late draft picks — 171st and 210th respectively. The Red Wings have created a blueprint for success. The Lions should be watching closely. Lions defensive tackle Ndamukong Suh quickly became a fan favorite in his rookie season. Now he’ll add a few more admirers when he hosts the Old Spice Ndamukong Suh Football Camp on June 28 and 29 at Walled Lake Western High School. Suh is not just providing his name, he’ll be on site to help with camp activities and provide instruction for the camp which is open to boys and girls ages 7 to 14. Campers will receive an autographed camp team photo with Suh, camp T-shirt and the chance to win additional contests and prizes. Cost is $199. Visit www.CampSuh.com for details and registration or call (888) 389-2267. Let you in on a little secret. After wide receiver Titus Young was drafted a week ago by the Lions, he was on a conference call with the media. It’s the same for every draft pick, only Young was different. He had some of us (including me) laughing so hard we were crying. It was his enthusiasm. You could feel it over the phone lines. Young is totally excited to be the newest Lions’ wide receiver. Not only will he have a great chance to be on a team that’s getting better, but he was emotional because Detroit is the hometown of his mom Teresa. If you don’t follow him on Twitter, you should probably start right now @TitusYoung. He’s a frequent tweeter and likes to interact with Lions fans. My guess is that when the season starts fans will like all five picks, but Young’s personality may set him apart. Following the NFL draft, the Lions improved their chances of winning the Super Bowl. I kid you not. Their odds went from 40/1 to 35/1. Those are the same odds as the Vikings, Texans and Chiefs. Fourteen NFL teams have better odds with Green Bay and New England at the top of the list at 7/1. A few more interesting odds, thanks to Bodog.com, reganding the Lions. RB Mikel Leshoure is 12/1 to win offensive rookie of the year while WR Titus Young is 14/1 in the same category. Cam Newton is the favorite at 5/1. The Lions first-round pick, DT Nick Fairley, is tied with Von Miller with 13/2 odds to win defensive rookie of the year. CB Patrick Peterson is the favorite at 6/1. Now all we need is a season. With all the giddiness about DT Nick Fairley joining the Lions’ defensive line and playing with Ndamukong Suh, often one name gets left out. Defensive tackle Corey Williams, who the Lions acquired in a trade last offseason, had one heck of a season in 2010. His numbers weren’t as gaudy as those of Suh -- Williams had 37 tackles, a pair of sacks and an interception. But he was solid and played in all 16 games. Coach Jim Schwartz said he will rotate the three on and off the field. With Suh, Fairley and Williams, opponents’ offenses will never get a break. All three will be fresh all game. Sammie Hill might get in the mix a little too. The 30-year-old Williams will be playing in his eighth NFL season, whenever that may start. When Sept. 11 rolls around this year it will likely be a heart-wrenching day. It will mark the 10th anniversary of 9/11 and with the demise of Osama Bin Laden it will have a more significant impact. Coincidentally it’s a Sunday and is scheduled to be the first Sunday of the 2011 NFL regular season. The Giants will be at the Redskins, while the Cowboys will be at the Jets for the night game. The Lions will be at Tampa Bay that day. The NFL doesn’t get everything right, but it’s a league that routinely honors the country and its military. Sept. 11, 2011, will be a day of remembering and should be a day to celebrate our freedom too. Count on military fly-overs, along with spine-tingling renditions of the national anthem. We can never forget 9/11 and the NFL can help us remember. If the NFL and NFLPA can’t get their act together to get the season started on time, it will be a darned shame. The draft grades are in and the Lions rank right up there according to national experts. Pete Prisco from CBSsports.com gave the Lions a B-plus. Like most everyone else he loves the Nick Fairley pick. Said he had Fairley rated as top player on his board. Rob Rang of CBSsports.com gave the Lions an A-minus saying: “It doesn't get much better than the Lions' first three selections, as general manager Martin Mayhew proved just as capable of finding talent when drafting outside of the top 10 as he had in selecting Matthew Stafford and Ndamukong Suh the past two years.’’ On his report card the Lions had the second-best draft in their division. Rang gave the Packers a solid A.
ESPN’s Mel Kiper has the Lions as one of two teams that received an overall A-minus for the draft. The other is the Bengals. Kiper gave the Lions an A-plus for value and a C-plus for filling needs. His colleague Todd McShay said the Lions’ best move was nailing their first three picks.